Ironically, the person who has been sending me gormless as of late is none other than Antony Gormley…. Firstly, I went to my dream destination a few months ago – Liverpool. I am not sure why, but I feel gravity tug at my knickers when I hear a Liverpudlian accent and I wanted to see if I could keep em’ up up north. I also, of course, wanted to see the city of rich culture and fascinating heritage. We hit the Tate to see the René Magritte exhibition, which was phenomenal. And then we went to Crosby Beach. A city with a beach is my kind of place, admittedly this was more scarf on than bikini on and more chip in than tummy in. Gormley has created ‘Another Place’ on this bleakly unique beach. 100 cast iron sculptures of his body stretch across 3 km of the foreshore.. Each sculpture is weathered according to how often the waves eat it. Those closer to the shore are covered in algae and those further out look more composed…. immigration, nature, humanity… it comments on the lot. The sculptures aren’t going anywhere (despite complaints that they’ve been mistaken for people going to their death – REALLY?) so get to Liverpool and see them! On top of this I also managed to nab tickets to Survivor – a new collaboration with Hofesh Shecter and Antony Gormley at The Barbican. Impossible to explain, this was an explosion of beautiful music, choreography and visuals… A white mummified body (a dancer not a dead one – that really would be pushing it) is trapezed at a great height, whilst a violin plays and a large screen depicts a waterfall. 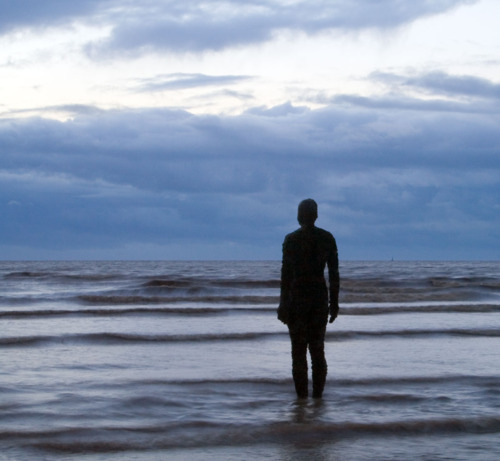 All in all, Antony Gormley – you sure know how to get a girl giddy….